Every February 3 is Feed the Birds Day. This is an important day for the health and survival of your wild backyard birds. If this is the first time you feed backyard birds, you will quickly discover the fun of birdwatching.. This special day is celebrated in early February, during the deepest, coldest and snowiest part of winter. It also the time when food is the scarcest, with much of it hidden under the snow. This is the time your backyard birds need your help the most. The seeds in your feeder provide energy and strength, to help birds make it through the rest of winter. Birdwatching is the the biggest hobby of all, enjoyed by people young and old. Coaxing wild birds to make your backyard their home, is accomplished largely by having a readily and consistent food source. 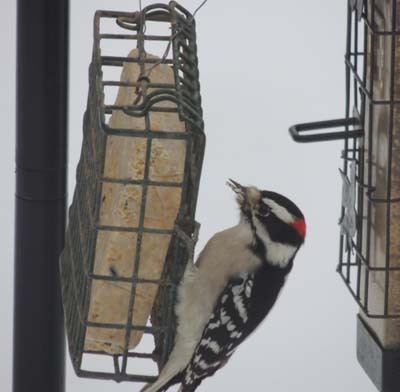 Your bird feeders are that vital source. 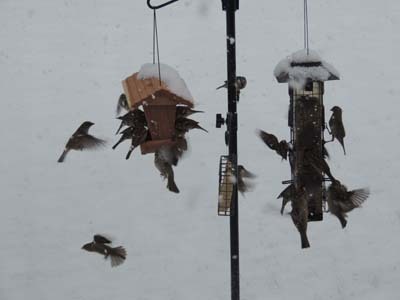 On this day, everyone is encouraged to leave out food for backyard wild birds. Better still, make this the start of a daily habit of feeding your backyard birds. Seeds are the best food for them at this time of year, as it is a high energy food source. Breads do not offer nearly as much energy, but will do when food is scarce and you don't have any bird seed. In addition to feeding birds, today is also a day to educate the public about wild birds and their needs. We encourage schools and businesses to hold classes and seminars about birds and especially about winter survival. Important: Once you begin feeding the birds, it is important to do so consistantly, as they will rely on the seed for survival. Different species of birds have varying seed preferences. See Bird Seed Feeding Chart. Feed the Birds Day was created by Bob Matthews of Rochester, NY in 2016. It is a day that is vitally needed, and could save the lives of many backyard songbirds. Please feed your wild, backyard birds today and every day.